Well, it’s official… Akshara and I have gone bananas. You may think I am speaking of the state of our minds, since, according to “normal” society, we live a very alternative lifestyle and some may argue that we are a bit crazy… but I am speaking literally here. 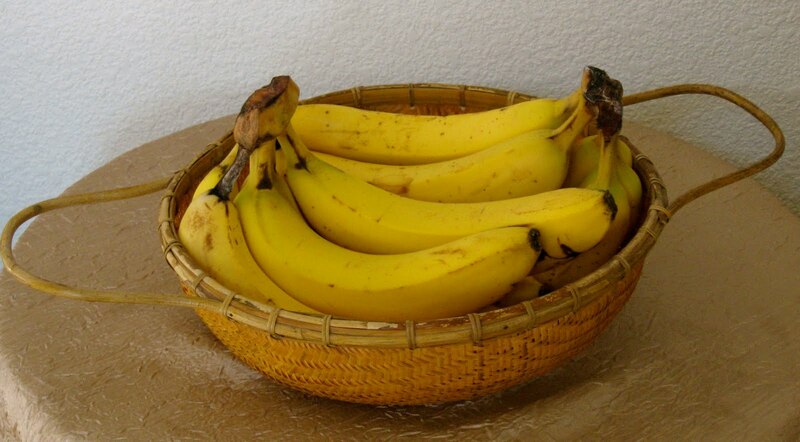 We now eat LOTS of bananas… because we are now eating only raw live foods. Some people refer to this as raw vegan, raw foodists, raw foodies or living a raw lifestyle. Whatever the name, it has been the best decision we have made for our health, our well being and our overall quality of life. Although we have been juicing for several years, sometimes daily, sometimes only a few times a week, this transition really began about 8 months ago when I watched a video of David Wolfe on YouTube. I was searching for videos on “superfoods” because I love goji berries and cacao, which are two of the well known snacks that are good for you. We had added these into our diet, but other than that, we were still eating a healthier version of the average SAD (Standard American Diet). David Wolfe shared an amazing superfood smoothie recipe on the video, which was very inspiring. He loaded this smoothie with many different superfoods, yet it seemed like it would taste good. He said he lived on this for three months! I wanted to add more of the superfoods to our diet, so I took down the recipe and gathered many of the ingredients. Some of them were hard to find, or I knew they wouldn’t agree with us, so I avoided those and added some others which I knew would be good. I created a superfood smoothie recipe of my own, which, according to Akshara, tastes like cold hot chocolate. We have been making one of these smoothies daily since then and I give it the credit for getting us started on the raw diet. Next, about four months ago, I stumbled across Victoria Boutenko on YouTube (great raw resource, by the way) giving a lecture on raw food. She was very inspiring as well and shared her recipe for Green Smoothies. Basically, as a raw foodist for over 20 years, she researched the effects of raw food and realized that some people, including herself, were reaching a health plateau. She and her family had felt wonderful and improved their health continuously for many years, yet at one point things stayed at a point that she knew could be better. She researched into the nutrient level of the foods people eat, even as raw foodists, and realized she needed to add more greens into her diet. Greens, she found out, were the key to optimum health. She began reluctantly chewing and chewing her kale everyday, yet it was a real chore, as many of us know or can imagine. One day she decided to throw the kale in the blender with a few bananas… and viola! She created the green smoothie, which has taken off in the raw world like wild fire. As soon as she gave this recipe on the video, I clicked the pause button, jumped up and headed into the kitchen to see if we had any ingredients that I could use to make a green smoothie. Luckily, we had romaine lettuce and apples. I proceeded to put them in the high speed blender we had gotten from my in-laws for Christmas this year (which was the best gift ever!) and pushed the smoothie button. I took a sip of the bright green liquid and was pleasantly surprised that the fruit masked the bitterness of the greens in such a way that it tasted sweet and refreshing. I have been making these daily ever since then as well. It is such an easy and delicious way to incorporate more greens into our diet. So here we were, two smoothies a day, yet still eating the standard diet, minus gluten at this point. I was feeling better, having been experiencing health issues for several years now. I could sense that my body was enjoying the added benefits of the nutrients I was giving it. Yet, I was still waking up every night with a cough and needing the neti pot every morning. I had been experiencing asthma symptoms for years, had digestive weaknesses and was tired most of the time. Sleeping 10 hours a night was normal for me. I couldn’t exercise much because of my breathing issues. I was taking an inhaler almost every night when I would wake up coughing and wheezing. My husband thought I either had walking pneumonia or cystic fibrosis. We don’t have health insurance, so I was reluctant to go to a doctor. Plus, I had gone once when I had a horrible flu a few years ago and they prescribed the inhaler and mentioned steroids. No thank you! I had also developed plantar fisciitis in both feet and couldn’t be on my feet very long. I also had chronic back and neck pain. On a side note, as a qigong practitioner, I was hoping all of these symptoms would just go away by doing my daily energy cultivation. I had heard some miraculous stories that backed this belief up. But after over 10 years of practice, I knew this just wasn’t the case for me on the physical levels that I was experiencing. I now believe that healthy qi and healthy food is thy medicine. And the more alive and full of energy the food is, the more it can have a drastic effect on our health and well being. So the smoothies were going along quite well for us. We enjoyed them everyday and ate around them. But then a month or so after incorporating the green smoothies, I caught an awful cold and it just wouldn’t go away. I was sick for over a week and coughed for three. Akshara thought I was drowning in my sleep. I woke up on a Saturday morning and thought I actually did have pneumonia. I would have gone to a doctor that day, yet the local “cheap” clinic was closed on Saturdays. So I decided to drink only the green smoothies for the weekend and took some MMS, which is a natural antibiotic, shown to kill bacteria and viruses. I took MMS every hour that day and the next and went through quite a detox. After a few days, I felt better, yet I was still coughing at night and using my inhaler. The last straw was the following weekend. We ordered pizza (yes, we were cheating on our gluten free diet). We both felt so sick that night and for the following three days. After we had slowly recovered, Akshara came into the living room one morning and said, “Ok, let’s do this. Let’s eat only raw food.” I was surprised, hopeful and hesitant all at the same time. We had been toying with the idea for a little while, yet committing to it was a big deal. Giving up any hopes of ever eating at our favorite Indian buffet was my first thought. Giving up any hopes of going to a social gathering and enjoying the food… and giving up popcorn at the movies! Yet, I knew this was an all or nothing kind of thing. We had added the smoothies in and we had added salads and fruit and juices, yet we were still feeling sick. Some people can eat an 80%, 50% or even a 20% raw diet and feel great. This wasn’t the case for us and we knew we had to go all the way. We both can easily make excuses and justify things and before we know it, we would be ordering pizza again. This way, with becoming 99% (nobody’s perfect!) raw, there isn’t room for that. We have discovered that it’s actually easier for us this way. So here we are, two months later, living a raw lifestyle. All I can say is Wow. I could go on forever about how it has changed our lives. I could talk about the detox phase, but the details of that aren’t very pretty. Let’s just say I coughed for another three weeks, worse than ever, yet now I am breathing completely free. My inhaler hasn’t been touched for over a month. Akshara is feeling much better, too. He had some health issues of his own that are now gone. We both have lost weight and at this point I am hoping it levels off because I don’t want to be too skinny! I have heard that on the raw diet people get to a healthy weight that they stay at. Our emotions have been somewhat of a roller coaster, yet we know this is typical as our bodies are releasing many years of toxins and some of that touches the emotional levels. Plus, eating for us, similar to many people, was emotionally related. With the raw diet, it is more difficult to “stuff down your feelings” with food. So the emotions arise and I breathe. Amazing. The most challenging moment of being a raw vegan so far was a month ago when I visited my family for my sister, Alisa’s college graduation and our parents took us to IHOP. I brought my raw muesli and homemade almond milk and ordered the fruit bowl. It was really good, and in truth it wasn’t that hard after all. I enjoyed being with my family and sharing a meal, yet I also felt good afterward. I wasn’t stuffed the way I normally would be after a breakfast like that. My family has been very supportive with this transition. My mom is on a restricted diet as well, yet was inquiring about a few things that we do that she could incorporate, including using the spiralizer to make zucchini pasta and the green smoothie (she drinks one everyday now, too!). My sister, Alisa has also added the green smoothie to her and her family’s diet since then. And just recently, Alisa visited us as a retreat/ gift to herself for graduating. I told her we would be eating raw food and she was welcome to eat it with us, or buy whatever she needed. She bought a few things, but didn’t end up eating most of them. She mainly ate the raw food and loved it! While visiting her, I noticed she loved the blueberry cobbler she had ordered at a restaurant. I wanted to share the raw version with her, so I made her a raw blueberry cobbler, which she loved. She went home with an optimism about increasing raw food into her and her family’s diet. The thing about eating raw food is that it really is very simple to add to any diet. Everyone is a percentage of a raw food eater already; even people who eat only fast food are eating raw tomatoes and lettuce! Simply increasing the live food can have a dramatic effect. It’s fun to make new recipes… especially the desserts – and they are ready right away! It’s creative with children – sometimes while making a dessert I feel like I’m 8 playing with my food and making something to share with my family. It makes my giggle. Guilt free desserts – just nuts and fruits, which are full of nutrients! Lots of flavor… fruit is so delicious! Less time sleeping (now 6-8 hours) and more time playing! Did I mention the desserts?! So I encourage you to add more raw into your diet and I support you in whatever level of raw food you want to incorporate. The raw food lifestyle may be out on the fringes and it may be looked upon as weird. Some people may think you have “gone bananas”, but it’s okay. You will feel better, maybe even great and you will have taken charge of your own health, which is so empowering and uplifting. You will have increased your chances of having an abundant, creative and joyous life and you will reach energetic heights that are normally thought of as only from mind altering drugs. I have such a sense of life now and I know it is because I am literally putting life into my body. A bit of a warning: Once you are eating more and more raw foods, the cooked food will begin to taste less pleasing and may make you feel sick. This happened to me (I snuck a piece of carrot cake at a birthday party and felt it immediately. That was the last cooked food I ate). Freeze a bunch of bananas and eat them frozen or blend in a food processor for a soft serve ice cream. This entry was posted in The Cornucopia and tagged Healthy Living, Raw Food, Recipes. Bookmark the permalink. Fascinating story. More and more I wonder how much our ailments today–asthma, foot and leg pain, digestive ailments, and so much more–have to do with ways our foods are grown and processed. My grandparents, who grew their own food long before gmos, and who never used pesticides or antiobiotics, ate mountains of fried foods, greasy meats, pies made with lard in the crust. All of it home grown, home butchered, home rendered, home churned. They lived to be very old, as did their many brothers and sisters. I wonder if they had had such long successful lives if their diet were more processed, like my dad's, who died at a young, for his family, 80. Hi I loved reading about you going raw and how family are making green smoothies too. I love green smoothies-and reading people's experiences about how they can cure lifelong medical probs- they changed my life- I'm a vegan too but was eating hardly any raw food till green smoothies! Now I eat a lot of raw food- still battling with not having hot food at night-especially now in winter! Though I'm not even close to eating raw foods exclusively, I have always craved them and feel bloated and sluggish when circumstances prevent getting the ones my body tells me I need. Grocers have always commented on the amount of produce in my cart. One time, the checkout clerk said, "I thank you. Albertson's thanks you, and our produce man thanks you!" Thanks for providing all these recipes, and for sharing your story. It's very important that we share our stories with one another.